It's been a long, slow road, friends, but here we are. In mere hours, Pokémon Go will let us engage in PvP battles. The Pokémon we catch and nurture in Niantic's hit mobile game will soon fly at each other's throats, as is the natural order of the Pokémon universe. All praise and glory to the black, chaotic heart of Giratina. Though you can download the PvP update now on Android and iOS, it might take a little while for it to arrive on servers. Kat recently previewed the new feature, and she gives it her stamp of approval. It helps that Pokémon Go's PvP goes well beyond the "tap-and-swipe" battles we use to conquer Gyms. Instead, fighting between PvP Pokémon (in teams of three) is tactical and based around swapping out team members and using "Protect" at crucial times. "It's obviously nowhere near as deep as the mainline RPGs, where abilities, traits, movesets, and hidden stats all come into play, but the battles are quick, and they have at least a little bit of depth," Kat writes. "I actually prefer them to 3v3 in the standard games, where one unfavorable matchup has the chance to completely wreck your chances." You can challenge other trainers face-to-face by scanning their Battle Code, and you can fight remotely with your Ultra Friends and Best Friends. What's a little Pokémon pit-fighting between pals? You can earn rare rewards like Sinnoh Stones for participating in battles. 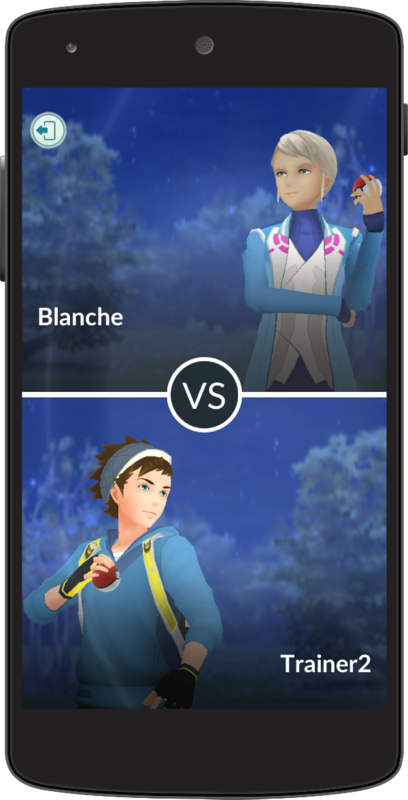 If you need PvP practice or simply lack friends, Pokémon Go's team leaders—Spark, Candela, and Blanche—will fight you if asked. Blanche looks like she's doing you some huge damn favor by interacting. Enjoy your Glare of Judgement, Team Mystic members. Reminder that Blanche probably wouldn't fetch you a glass of water if you were on fire. Our Pokémon Go PVP guides will help you put up an epic fight against any trainer who dares challenge you. Check out all our Pokémon Go guides, tips, and hints. We have tons.